Best School Partnership, sponsored by BAE Systems, presented by Dave Rollo to Claire Reid, Education Manager and Calum Murray, Education Officer at The Ecology Centre. Pic: Kenny Smith. 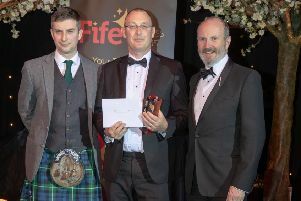 It was one of 12 category winners at the 2019 Fife Business Awards, held at Rothes Halls, Glenrothes, last week. The centre won the ‘Best School Partnership’ category sponsored by BAE Systems. The judges praised the team at the centre, saying: “The Ecology Centre has a strong relationship with its school that has been built up steadily over a number of years, and that embeds the centre’s activities in the school’s curriculum. “It allows pupils to learn and practise the ‘soft skills’ employers require from their future workforce.